Isn’t it just like God to do it different from the world? I mean, haven’t you heard, you reap what you sow? In this case it would seem exactly the opposite. I’ve grown to realize that some parts of scripture don’t seem to make sense until you’ve been there or watched someone you love experience something. Take for instance my friend. I’ll call her Katy. She lost a job she loved for very unfair reasons two years before retirement. She not only loved her job, she loved her coworkers, and her family needed her income. Her faith was strong, but her tears were many. One day while we gathered for an event that was typically filled with joy and celebration, Katy walked in with tears. She tried to hold them back, but one thing had piled onto all the others and she broke. She wept. Her whole body wept. She was in tears and those holding her were in tears. Yet that day Katy showed up to serve at a women’s event while walking through one of the hardest times of her life. Katy was still sowing. Even after being stripped away from her job and friends, she planted for the Lord. In verse 4 the psalmist asks for restoration and renewal. And I believe that is what we did the day we held Katy in our arms and simply whispered “Jesus”. She was in exile. We trusted the Lord would be faithful and do amazing things, but our friend needed restoration. We prayed for joy to fill her heart and dry her tears. In a season of tears? A time when so many drops fall from your eyes that you are certain there cannot be any more. May I encourage you? As a woman who has cried enough during troubled times to fill a small river I need to tell you that on the other side of tears there can be joy. I believe the key may be in that little word sow in verse 5. (The NLT translation says plant.) Planting produces a harvest. Here we learn, sowing our tears can reap joy. 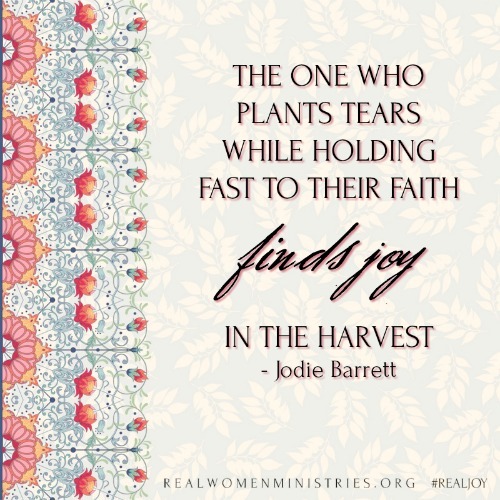 The one who plants tears while holding fast to their faith finds joy in the harvest. So what can we do when water wells in our eyes and soaks us wet day after day? We can plant – In our suffering we can continue to work of the Lord. We can remember – Remember the promises of God. We can ask – Just as the psalmist did we can request restoration and renewal. We can hold one another – Love, encourage, and pray for those suffering. We can wait and we watch – The harvest produced from the planting we continue during times of pain comes in the morning! Remember Katy? I’m happy to report that she has a job and is experiencing days of joy. It took many months of trust and prayer, but the harvest was worth the wait. It’s hard when tears flow uncontrollable. Weeping often hurts deep. Pain tries to take our joy. Be our strength during the hurting. Strengthen us so we may sow even as tears fall. Bring us joy in the morning Lord! Amen. 1) In what ways can you continue to do the work of the Lord despite your sorrow? 2) Can you think of someone in your life who has been hurt deeply? How can you love and serve this person, being the hands and feet of Jesus to provide His comfort in tangible ways? 3) Do you believe your joy will come, even if it isn’t tomorrow morning? Why or why not? Are you stuck in a time of sorrow right now? If so, we’d love to pray for you. You don’t have to give us details just comment below and we’ll pray for you. 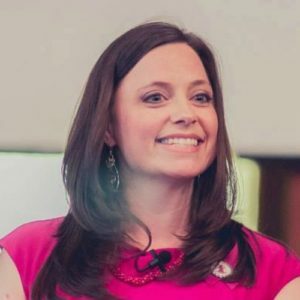 Jodie Barrett is a wife, mother, homemaker, office manager, teacher and speaker. She enjoys using the gifts that God has given her combined with the wisdom gained from the Word and life experiences to motivate and encourage women to strengthen their faith. Catch up with Jodie on her blog at Faithfully Following Ministries and Facebook and Instagram. Jodie, your words soothe a heart filled to the brim with tears. I know the harvest-joy is just around the corner. Thank you, Jesus. Michele, I wish I could hold you in my arms and whisper “Jesus”. I’m holding you in prayer! My mom just lost her high school sweetheart of 54 years. This is a very difficult time for all if us. Jodie – this felt like it was written just for me! Thank you so very much!